Senator Claire McCaskill speaks at Lona's Lil Eats in St. Louis on Aug. 30, 2018. As she battles for a possible third term, U.S. Sen. Claire McCaskill appears to be embracing her reputation as a dogged competitor who can give as good as she gets. And she gives some of the credit to her mother, Betty McCaskill, who was the first woman elected to the Columbia City Council. After Claire McCaskill lost the governor's race in 2004, she said her mother advised her to ignore the old Democratic state adage of focusing primarily on St. Louis, Kansas City and their suburbs in order to get elected. St. Louis Public Radio's Jo Mannies takes a look at U.S. Sen. Claire McCaskill's past and present as she seeks a third term. Republicans who are out to dismantle her rural reputation by accusing her of making rural voters think she is more moderate than she is. Some fellow Democrats who complain that she hasn’t spent enough time in the urban areas where she needs the most votes. McCaskill appears to be paying attention to the urban beefs. Just in the last few days, she’s appeared at rallies in Kansas City and dropped by church services in St. Louis. Meanwhile, the senator’s allies have accused her Republican rival, Missouri Attorney General Josh Hawley, of campaigning almost exclusively in GOP strongholds, which include St. Louis’ western suburbs. Born in rural Missouri, McCaskill spent her youth and college years in Columbia. She went to Mizzou for college and law school, then moved to Kansas City, where she soon was elected to the Missouri House. McCaskill ran successfully in 1992 for Jackson County prosecutor, and won a spirited contest for state auditor in 1998. In 2006, two years after her loss for governor, McCaskill literally hit the road for the U.S. Senate in a bus. Her mother often rode along. Her frequent rural tours since then have been part of McCaskill’s quest to snag any possible votes, even if that means making pitches to infrequent voters who may not support her. Which is why McCaskill recently set up camp in the middle of the student center at the University of Missouri-St. Louis, as part of a statewide tour of college campuses. Amid a backdrop of rock music, McCaskill fielded students’ questions on a variety of topics, including reproductive rights, health insurance, student loans and net neutrality. Sophomore Taylor Jackson was impressed. “I believe she gave an excellent speech. She was specific. She was definitely passionate,” he said. 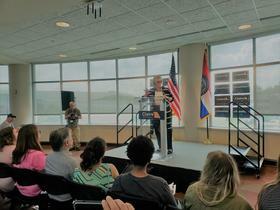 McCaskill acknowledges that young voters are notorious for not showing up at the polls. But she’s hoping this fall might be different. McCaskill’s big issue this electionis health care, and protecting insurance coverage for people with pre-existing conditions. She has been hammering at Hawley over his involvement in a lawsuit – backed by President Donald Trump – that would do away with the Affordable Care Act’s protective provisions. That includes a requirement that young adults be allowed to stay on their family’s insurance until they are 26, and a mandate that insurers offer coverage for people with pre-existing conditions. “He is currently in court, trying to ask the court to invalidate every single consumer protection in the ACA. With nothing to replace it with. Nothing,” McCaskill said. At one rally in recent weeks, she blasted Hawley’s ads where he contends that he does support such protections, and accuses McCaskill of misrepresenting his views. “This is called the Potomac two-step,” McCaskill said, noting that many GOP candidates around the country are offering the same argument. Hawley says there are ways to protect coverage for people with pre-existing conditions without the ACA, which he contends has been too costly and hurt many American families. Hawley’s chief line of attack has focused on McCaskill’s opposition to new Supreme Court Justice Brett Kavanaugh. He says McCaskill has been “complicit’’ with the effort by Democratic leaders to destroy Kavanaugh’s reputation in order to block the judge’s confirmation because they oppose his conservative views on such issues as abortion rights. She also has blasted the confirmation process as too partisan. “One side saw it very clearly one way, the other side saw it very clearly the other way, and probably a whole lot of Missourians thought the whole thing was a big mess,” she said. Outside groups have spent more than $52 million so far on ads that primarily attack Hawley or McCaskill. In her case, the key target has been the wealth of her husband, businessman Joseph Shepard, who she married in 2002. Senate financial filings show that Shepard has invested in close to 300 limited partnerships. Some of them focused on the development of low-income housing, much of it in rural Missouri, which have received government subsidies. Nonpartisan fact-checking groups say the claims are false. Despite her quest for new voters, McCaskill’s success will likely hinge on attracting huge turnouts from traditional Democratic groups, including women, union members and African-Americans. Those blocs made up the enthusiastic crowd at a recent St. Louis event, where the senator received an award for her work to help protect Social Security, Medicare and retirement pensions. Some African-American officials, while declaring their support for the senator, say she hasn’t done enough to energize urban voters. St. Louis County Councilwoman Hazel Erby agrees with some of the criticisms, but says fellow African-Americans must understand the stakes and show up at the polls. McCaskill has gotten more public support lately from such prominent urban Democrats as state Rep. Bruce Franks – who has sparred with Hawley’s camp on Twitter – and U.S. Rep. Lacy Clay, who led a contingent Monday that blasted Hawley over his defense of the state’s newly implemented photo ID law. There’s no debate that Missouri’s U.S. Senate contest is among the most closely watched in the country and could determine which party controls the Senate next year. Both sides also agree that the contest remains neck and neck as McCaskill and Hawley head into the final stretch. With less than three weeks to go before the midterms, Democratic incumbent U.S. Sen. Claire McCaskill and GOP Attorney General Josh Hawley debated each other about key topics in their race — with varying degrees of veracity. Here’s a few of their statements, fact-checked. A once-obscure health insurance buzzword — pre-existing conditions — is taking over the U.S. Senate race in Missouri. And the seemingly narrow issue could have a wider effect on the federal health care law, depending on whether Republicans maintain control of the Senate after the Nov. 6 midterm election. Democratic U.S. Sen. Claire McCaskill has a clear fundraising edge over her Republican opponent, state Attorney General Josh Hawley, in her re-election race — with about a month left before the Nov. 6 midterm. McCaskill brought in $22,785,442, as of the July 18 report to the Federal Election Committee, or FEC. In contrast, Hawley had raised $5,320,513.